put two eggs in a pot of heavily salted, cool water. make sure they are completely covered or you run the risk of experiencing a little breakage. bring the water to a boil, cover the pot, turn off the heat, and let the eggs sit in the hot water for around 20 minutes. once finished, drain the water, rinse the eggs under a cold tap, and set them in the fridge to cool while you prep your other ingredients. rinse and pat dry your chicken thigh. season it how you please, but remember that you will most likely be pan-frying, baking, roasting, or boiling. fried chicken is actually considered one of the few no-nos when it comes to cobb salad as far as i understand. i rubbed my chicken with dried basil, some cumin, oregano, olive oil, and thyme. i then cooked it in a frying pan over medium heat until it was done all the way through. once finished, pop it on a plate, cover it with plastic wrap, and set it in the fridge to cool. slice some bacon super thin. remember, you are going to want to make your bacon nice and crispy, and if it is too thick, it’ll end up chewy and cumbersome to eat in a single bite. cook the bacon over high heat it a frying pan until it is good and crispy. set it aside on a paper towel or two, and then set another paper towel on top to soak up the remaining grease. this will help your bacon stay crispy as it cools. split open your avocado and remove the pit. run a sharp knife in a lattice-work pattern along the inside of the avocado, and use a spoon to scoop out the flesh into a small bowl or cup. add mayo, three or four spoons of olive oil, thyme, dill, and then salt and pepper to taste. take six or seven leaves of shiso and chop them with the pale, rough side facing up. once they are minced super fine, add them into the dressing and blend with a stick blender or food processor. the result will be super similar to a green goddess, only with a little more zing. prepare your lettuce. make sure to check for bugs if you have really fresh stuff, and break off the stems for the sake of consistent texture. once the leaves are ready, toss them in a colander under cool water. drain them of as much excess water as you can. stack them all together and tear them onto a large plate. set the plate aside. cut the base off your green onions and chop them super finely. use a very sharp knife to cut the mini-tomatoes into quarters. wash your sprouts, drain them, and then separate them from their attached root structures. go to the fridge. get out the chicken and the eggs. now is an appropriate time to get excited, because you are about to put together a really beautiful salad. peel the shells off the eggs. you have some options. you can either chop the eggs or slice them into rounds. i tend to go with the chopped method as it makes a more cohesive salad when tossed with the other ingredients, although rounds are a little more picturesque. dice the chicken. unwrap the bacon. prepare yourself. place a row of each ingredient on top of the bed of lettuce. make sure that ingredients which have similar colors do not end up next to one another. for instance, chicken and bacon do not belong side by side. green onion and sprouts should be separated. 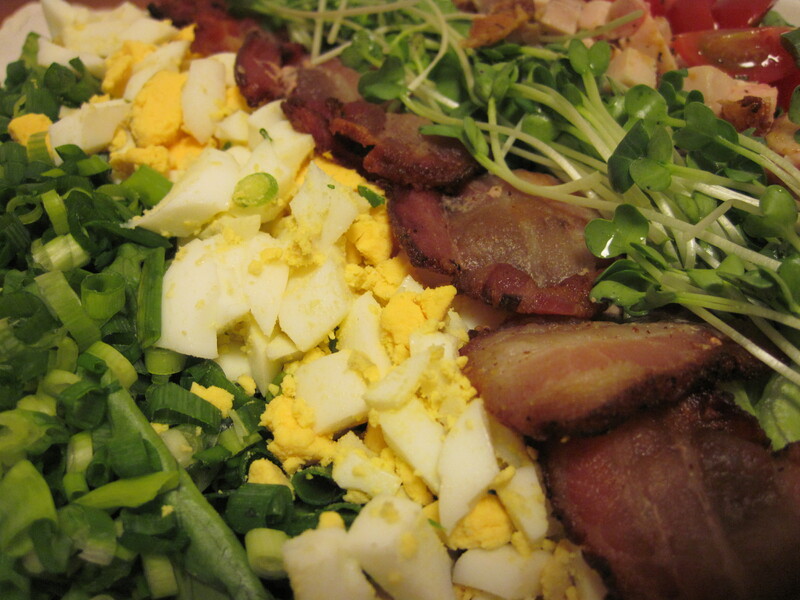 i chose to use red, pink, green, red, white, green (tomato, chicken, sprouts, bacon, egg, green onion) in that order. cover with a crosshatching of the shiso green goddess dressing. remember, it is up to you whether to toss the salad or not. i chose not to. when i ate mine, i just decided which rows i wanted to eat together and hand-picked the flavors for each bite. bring it out to the table, and watch your guests’ eyes become as wide as dinner plates.